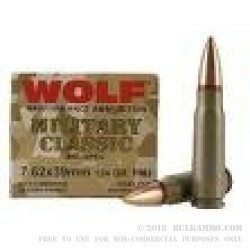 Range time with your AK or SKS has never been easier to get thanks to this inexpensive 7.62x39mm ammunition from Wolf. These cartridges fire a 124 grain bimetal jacketed bullet and deliver typical ballistics for this caliber. Each box contains 20 rounds. This ammunition is loaded in Russia and uses non-corrosive Berdan primers and steel cases. While the cases are not reloadable, they are the type of ammo that the SKS and AK were designed to work with and provide extra-reliable cycling thanks to their polymer coatings.